Are Amy's Frozen Meals Healthy? Since this review posted, I have done another Amy’s Frozen Meals Review in 2016. Amy's have always seemed to be a little bit healthier alternative to most frozen meals (Lean Cuisine, etc.) but I know they are still very processed? and always have a LOT of sodium, a major problem with most prepackaged meals. The low sodium meals options cut sodium in half -so is it a good choice for a meal?? Or still not as good as cooking yourself? I'm in college and it's great for a fast meal when I don't really want to cook all the time! BUT, the ingredients list was impeccable with organic black beans and vegetables. The great thing about frozen foods is that they use zero preservatives. They don't need them because the freezing process preserves the meal. Every ingredient in this burrito was recognizable and healthy! Jahna was interested in the Light in Sodium meals which include burritos, macaroni and cheese, and a Mexican Casserole bowl. I didn't taste it - but I might go give it a try. Again, the ingredients are pinto beans, whole wheat flour, brown rice, cheddar, etc. (you will recognize them all) and I would say this is a healthy choice. Jahna, if these had been available when I was in college (yes, dinosaurs walked the earth at that time), I would have eaten them. They contain real ingredients, no preservatives, and have excellent nutritional value (as long as you stick to the low sodium variety). Please share your favorite Amy's meals. I do like several Amy's products, but I'm not sure why they can't get "over the hump" and get their products to at least 95% organic so they can get USDA certified. I like the Amy's meals. For awhile I couldn't convince my son (20) to eat anything remotely healthy. One day he grabs my Amy's black bean burrito and loved it. Even asked me to get more. I love Amy's meals their pizza's are great and I buy them whenever they are on sale at the supermarket. They taste more fresh then other frozen meals out there and while they do have a lot of sodium I think they are one of the best alternatives for people who want something healthy and don't have time to cook. I recently discovered Amy's Vegetable Lasagna. YUMMY! It has a good spinach taste and is very satisfying. Last time I heated one at work, I heard lots of comments from people wanting to steal my lunch. I keep several in my freezer for quickie dinners. I didn't care for the Tortilla Casserole (I think that's what it's called), but have loved everything else I've tried. If you're a six foot tall man, maybe you can get away with a frozen meal that's around 300 calories as a snack. But that's around 20% of your daily calories if you're a petite female who eats 1500-1600 calories a day... a bit less for a taller female eating 1800-2000 calories a day. When my weight goes up a bit, it's not usually because I've suddenly started to junk out--it's because I've become less vigilant about calories and portions for foods I think of as healthy, and started eating according to my appetite instead of calculating what will enable me to stay in my jeans! I have natural restraint when it comes to treats like chocolate that I KNOW are fattening--it's harder sometimes to stay vigilant with foods I think are "healthy." I love their Indian meals and their spinach pizza especially. Amy's is def better then most main stream brands ...but most of their products are very high in sodium. It takes about two minutes to prepare a burrito from scratch. And is a lot cheaper. Stock your fridge with organic shredded cheese , whole grain tortillas, and add some canned black beans. Eden Organic is the best brand since their cans are BPA free. Throw together and pop it in to the toaster oven. Question. I couldn't find Amy's at Marsh... so I left w/ nothing. 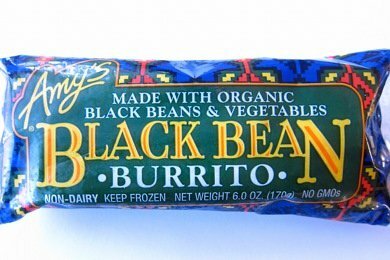 Then when I got home I started looking at labels online and it would seem that Tina's Burritos had fewer cals, fat, sodium... though not organic. Is organic that important in this situation? @Theresa - no, I don't think organic is important in this situation. If it has ingredients you can identify - and isn't high in sodium, etc., it is most likely a healthy choice. To me "organic" is like icing on the cake. I've always wanted to try the Amy's products. They do afterall appear to be more healthy than most frozen options. However the biggest problem is that they are just so darn expensive (at least in my area). I only buy the "lower sodium" items, with the brown rice veggie bowl with tofu my favorite (after sprinkling red pepper flakes and stirring them in). Unfortunately, the package of lower sodium enchiladas isn't Amy's standard one serving -- it is two. So, double that and it is nearly 50% of a low sodium diet. Keep in mind Amy's does not call these products LOW sodium because they are not! Lower is correct. Snack Girl incorrectly states that Amy's contains no preservatives, but salt is a preservative. I absolutely love Amy's ANYTHING. They put a lot of thought and concern into their product (of course along with the great ingredients). I fill my freezer full of these products when they are on sale. Whenever I eat Amy's products, I feel no guilt whatsoever because I know I feel satisfied and happy. Also love her pantry items, like salsa and soup, I buy cases of this stuff! This manufacturer has had MULTIPLE RECALLS on its products please be cautious, Amy's is withdrawing 4,800 meals of the product from all states in the Eastern time zone in addition to Alabama, Arkansas, Minnesota, Illinois, Missouri and Kansas . I would starve without amys. Dont cook for myself. Conjestive heartdisease. As long as keep count of soduim and eat lowersoduim products i am ok. Just got to be vigilant in counting soduim. Love all their lowersalt products and caneat organic YEAH!